Aging2.0, the global innovation platform for aging and senior care, today announced its new #30in30in30 initiative. This globally distributed program of events, in partnership with Google for Entrepreneurs, is designed to discover, showcase and support aging-focused entrepreneurs around the world via 30 startup pitch events in 30 cities in 30 days. 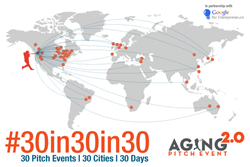 All #30in30in30 pitch events are being hosted by volunteer-run Aging2.0 local chapters. Events will be held on or between September 8 and October 8, 2015 and are taking place across the U.S. and worldwide; from San Francisco, DC and Grand Rapids, to Tokyo, Australia and Tel Aviv. Specific information about individual events is available on the Aging2.0 Eventbrite site and will continue to be announced in the CoverAGE Newsletter and website. Among other prizes, the 30 winning startups (one from each event) will pitch to the Aging2.0 team and corporate partners (the Leaders Circle and Alliance) in a virtual semi-finals event. A select few will then be invited to present and exhibit at the Aging2.0 AgeTech Expo and prioritized during the selection process for the next Aging2.0 Academy cohort. Sponsorship opportunities are available for companies looking to support at either the global or regional level. For more information please contact Grace Andruszkiewicz at Grace at Aging2 dot com. Those interested in attending and being part of the voting audience can register to for any of the scheduled events on Eventbrite here, and startups interested in participating can complete an application here. Media interested in attending events or interviewing participants, please contact Kimberly Angell of Wish PR at kim dot angell at wishpr dot com. Aging2.0 is a global innovation platform for aging and senior care. Aging2.0 connects, educates and supports innovators through our global chapter network, Academy accelerator program, Alliance membership community, Summit, AgeTech Expo and consumer panel. Within three years, Aging2.0 has become the premier global platform for discovering and cultivating innovations focused on aging and senior care. To learn more about Aging2.0, visit aging2.com or follow us on Twitter (@aging20).